We brought back some spiced rum from St. Maarten when we cruised the Caribbean earlier this year. I knew when I first tasted it that I would need to bake something with it. And when the Spiked Recipe Challenge ingredient this month turned out to be spiced rum? The perfect reason to get out that bottle of rum and do some baking. I used my go-to vanilla cupcake recipe and got creative. Warning: this is not your Grandma's rum cake. I think you'll like this though. Just as well - maybe even better! In another bowl, stir egg whites, milk, rum and vanilla together. Add butter to the flour mixture and mix together. As it starts to combine, slowly pour the milk mixture in and mix until completely combined. Line a muffin tins with 16 baking cups. Fill baking cups a little more than halfway. Bake for about 15 minutes or until cupcakes bounce back when touched lightly. Remove and cool. Makes about 16 cupcakes. Beat butter and one teaspoon of rum together. Add sugar slowly and beat until combined. Scrape down the sides and add remaining rum and milk. Mix until smooth and creamy. Stir all of the ingredients together in a small saucepan. Heat over medium-low heat until the sugar is dissolved and the liquid nearly reduced. Stir frequently. The nuts will be shiny and a bit sticky. Let cool and divide among the cupcakes to decorate. Pecans and spiced rum are a wonderful flavor combination! These cupcakes had just the right level of rum flavor - and the pecans added a lovely texture. All of my tasters agreed that the star of the show was the candied rum pecan topping. 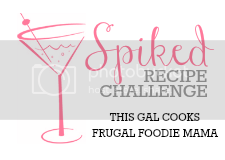 I'm joining Carrie from Frugal Foodie Mama and Julie from This Gal Cooks who are hosting another fun Spiked Recipe Challenge. Stop over and see the other Spiced Rum entries! Oh wow... I LOVE those candied rum pecans! :) They really make this cupcake. Thank you so much for joining us in this month's Spiked! Spiced Rum Recipe Challenge- good luck, Susan!